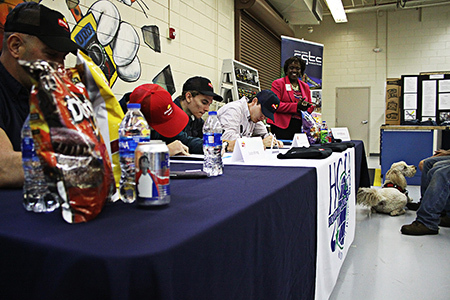 At the event, seven students signed a letter of intent with the snack foods company located in Perry, bridging the next phase of a collaboration to address local workforce needs. In early 2017, CGTC collaborated with the Houston County Board of Education and HCCA to form the Industrial Maintenance Program. As part of the innovative program, high school juniors and seniors are able to earn Technical Certificates of Credit in basic engineering and maintenance skills for college credit while on the Academy’s campus. Students are instructed by highly trained professionals at CGTC who know industry needs, which provides each student experiential learning and development that make them ideal candidates for employment with Frito-Lay. Frito-Lay conducted interviews upon their completion of the TCC to determine hires for its apprenticeship program. Later this summer the students will begin employment and in the fall, continue their postsecondary education at the College. This entry was posted in 2018 and tagged Frito-Lay, high school initiatives, Houston County, industrial mechanics, middle Georgia, Tony Shelley. Bookmark the permalink.